Whether you have a teenager or a soon-to-be teenager, post-secondary school planning is probably on your mind. As members of Graded’s High School Counseling Department, our job is to guide your family through the college planning process and ease any anxiety you may have. I would like to take this opportunity to introduce the High School counselors, offer an overview of our program, and provide further details on the college research and application process. Graded employs three full-time counselors who have educational training and years of experience working with high school students and families. One counselor deals with students and families in grades 9 and 10, and there are two counselors who focus on students and families in grades 11 and 12 when the formal college research process begins. Luciana Andrade is beginning her seventeenth year at Graded. In addition to working with students and families in grades 9 and 10, Luciana co-teaches the Peer Group Connection (PGC) leadership course and co-organizes the grade 9 PGC program. The program matches grade 12 PGC leaders with a group of grade 9 students to help guide freshmen through the transition to high school and provide academic and social support. Todd Daniel recently began his sixth year at Graded. Todd works with students and families in grades 11 and 12, those with last names that begin with the letters A-K. In addition to his work with students, Todd is the Test Center supervisor for the ACT and serves on both the Advisory Leaders and Child Protection Committees. Shelley Marks is in her fourth year at Graded. Shelley works with students and families in grades 11 and 12, those with last names that begin with the letters L-Z. Shelley is the Test Center supervisor for the SAT and serves on the High School Advisory Council as the Counseling Department’s head. 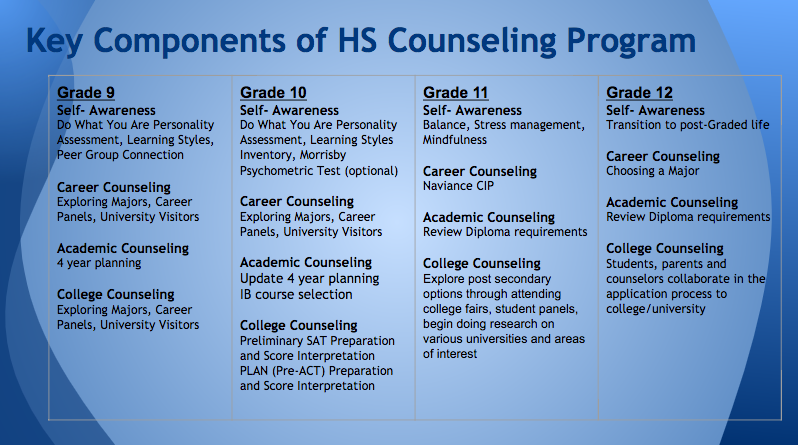 The philosophy of the High School Counseling Department is to offer a developmental, comprehensive guidance program that includes academic, personal, career, and college planning. We center our work around planned, sequential programs that aim to enhance student achievement and accomplishment, as well as to promote personal development of all students. This goal is achieved by meeting with students in both group and individual settings. The areas of concentration and example components are outlined below. Beginning in August 2017, we are very excited to have formalized counseling sessions with all grade levels built into students’ class schedules. We use these sessions to deliver our counseling curriculum. Ms. Andrade provides lessons through the social studies 9 and 10 classes. In grades 11 and 12, Mr. Daniel and Ms. Marks meet with students during Junior and Senior Core Seminars. In grade 9, the primary focus is on the transition to high school and developing good study habits while balancing extracurricular activities which may include sports, arts, clubs, and/or community service. Using Naviance, an electronic college and career platform, students begin exploring career interests and start preparing a résumé of their accomplishments, awards, and extracurricular achievements to include in college applications. In grade 10, we support students as they continue to focus on their academic achievements and explore their interests and passions. Students are encouraged to begin attending college fairs and speaking with Graded’s visiting college admissions representatives. All students take the ACT/PLAN and PSAT for exposure to a practice college admissions test. We use their results to help guide their future test preparation and planning. We also hold International Baccalaureate (IB) informational meetings for parents and students. Counselors schedule individual meetings during the second semester to create a two-year plan for students’ course choices and highlight the connection between course selection and college preparedness. Students continue to use Naviance to explore career interests and build their résumés. Overall, the focus of grades 9 and 10 is on classroom achievement rather than on college admissions. We believe that too much emphasis on college creates undue pressure and distracts students from the most important tasks at hand: doing well in their classes, exploring their interests, finding new ones, and enjoying their high school years. In grade 11, first and foremost, students need to focus on their academic preparation and adjustment to the rigor of IB. Students begin their formal research on universities through Junior Core Seminar, in which counselors guide students and parents through the research, selection, and application process. 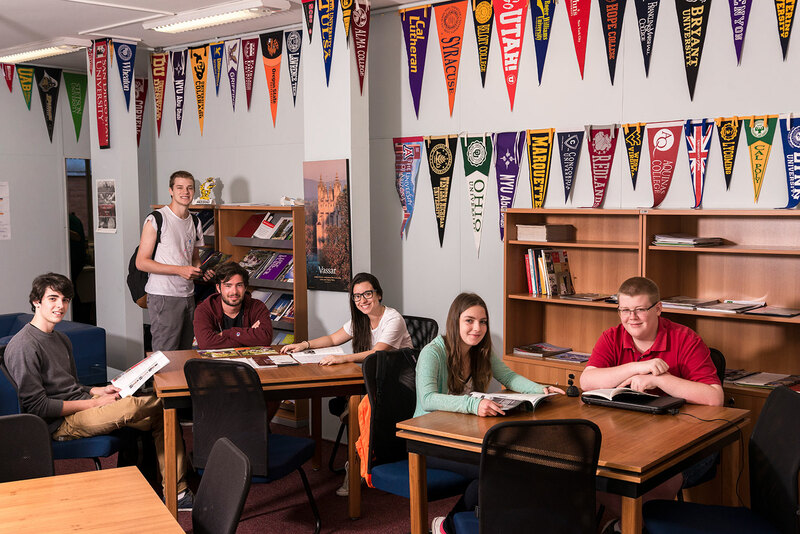 The focus is finding colleges and universities that are considered “best-fit.” A best-fit college is one that offers the course of study a student wants to pursue or provides opportunities for a student to explore if he or she is undecided. In addition, a best-fit college provides a community that feels like home. We encourage students and parents to look beyond rankings and choose schools which will provide the student with a positive academic experience and appropriate challenge. We introduce students to higher education systems around the world, after which they begin to develop preferences for the system(s) that best fit(s) their future aspirations. We also explore the location, size, majors, cost, and other characteristics that various universities offer. During their junior year, students increase their contact with college admissions representatives and begin to formulate a long list of colleges they wish to research. This long list is recorded in Naviance. Graded is fortunate to have more than 150 colleges visit its campus each year. Students meet with the college representatives during their lunch period or at specially scheduled events. Every October, all students take the PSAT/National Merit Scholarship Qualifying Test (NMSQT). We use results to guide students on how to prepare for and when to take their college admissions tests. Students typically take the SAT in December, May, and/or June and the ACT in December, April, and/or June. The National Merit Scholarship Corporation (NMSQT) uses junior scores to determine which students will become Commended Scholars, Semifinalists, and Finalists in the National Merit Competition (only open to US citizens and permanent US residents). Also in grade 11, we introduce students to the different parts of the college application process, such as the application, admission testing, essay, writing supplements, teacher recommendation, counselor recommendation, secondary school report, and interview. We provide students guidance on starting their college application essay and encourage them to have a good draft essay completed before the end of the school year. By May, we have counseled students on what a teacher recommendation is, how to select a teacher to write it, and how to ask for the recommendation. During the vacation months before their senior year, students may choose to visit colleges and/or attend a summer program. Either experience should provide students and their parents with valuable information that will guide them to narrowing down their list of colleges and finalizing those that meet their preferences about issues such as location, size, cost, and major. Additionally, students should continue to work on their college essays and have a nearly completed version of them by the start of their senior year. In grade 12, the first priority for students is to stay focused on their academic work. While continuing their normal course loads, students need to begin creating a list of colleges to which they plan to apply, also known as the “short list.” We recommend a maximum of 8-10 applications so that students may give due diligence to each application while balancing their academic, extracurricular, and social commitments. When crafting the short list, counselors work with each student and their parents to understand the student’s admissibility to each university. A good short list should have a few colleges from each admissibility area. For example, high/likely, medium/realistic, and low/reach admissibility. Students, their parents, and their college counselors will work together to identify schools that are good matches for each student. Students also register and take admission tests required for their applications prior to the application deadline(s). We encourage them to schedule individual meetings with their counselor before submitting any applications. Once applications are submitted, students are responsible for keeping track of all correspondence from colleges and for communicating with their counselors to ensure their application is complete and being reviewed for admission. Although it is tempting for seniors to reduce their academic efforts after this process is completed, we stress that college admissions officers will expect to see that students have worked hard to keep up their grades and continued their involvement in school and community activities. Though timelines differ between countries with regard to application deadlines and admissions notifications, most students will receive acceptance decisions by April 1 and commit to one college (and make a deposit) by May 1. During the second semester of senior year, students will focus on preparing for their IB exams and finishing their high school careers. Counselors support students through IB examinations by providing snacks before and after exams and de-stress activities such as mindfulness and pet therapy throughout the examination period. After IB exams and before graduation, counselors arrange transition sessions to prepare students for life beyond high school. We encourage you, as a parent, to attend the High School Counseling Department’s information meetings that occur throughout the year. There is at least one parent meeting for each grade level per year, and in grades 11 and 12, that increases to two times a year plus numerous individual meetings with counselors. We know that high school and planning for college are exciting and challenging for both students and their parents. Graded’s High School Counseling Department is committed to assisting our community throughout the process, helping to create a healthy home-school partnership. We look forward to working with students and families through the post-secondary planning process.